One thing I wanted to discuss in this section is Ethernet, and all of the forms it may take. When looking at wireshark captures, we may notice the Ethernet headers as “Ethernet II”. This is the most common Ethernet protocol we use today. 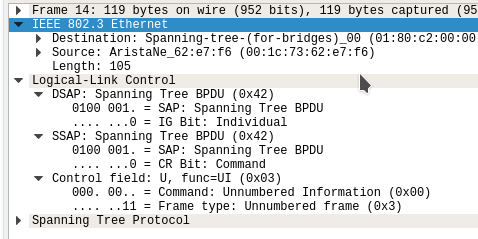 The above screenshot is nothing fancy, it’s the plain old Ethernet protocol we often see. However when looking at some L2 protocols, like CDP, DTP, STP we may notice these encapsulated by a different “Ethernet”. In this particular case I am using an MST BPDU from an Arista switch, however notice the encapsulation? IEEE 802.3 Ethernet. even though it never really took off. The jist if this information is you should be aware of 802.3 Ethernet and Ethernet II. Another thing I wanted to mention here is link autonegotiation. Autonegotation allows us to determine duplex and speed based on fast link pulses that NICs use. It can also determine interface speed, they will agree on the fastest speed supported by both. If one side of the link is hard coded (duplex and speed) then the auto neg side will failback to half duplex, but it can detect the correct speed. If these are Cisco devices and they have CDP enabled (by default) they will warn create syslog messages about duplex issues.